As you’ve recently discovered, I’m currently on a color infrared film kick. I’ve packed my Rolleiflex Automat MX camera with infrared print film (and slide film) and taken it for various walks around upstate New York. And this time, I’ve decided to go back to previous photographed subjects … and give them another snap, just to see how they would appear in an otherworldly viewing. 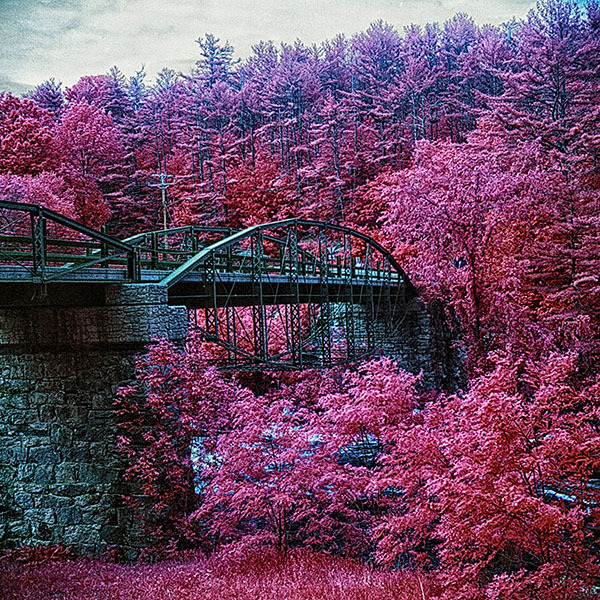 Remember, with color infrared film, and when used with a yellow pass-through filter, green foliage turns red, bright blue skies turn dark, water turns black, and inanimate objects like metals and stone remain solid. So how would this look when one photographs … oh, I don’t know … the Hadley Parabolic “Bow” Bridge that spans the Sacandaga River? You know … this one. Parabola: From Hadley to Corinth. Photo by Chuck Miller. So I photographed this bridge way back in … 2014, 2015, one of those years … and I used Kodak’s HIE infrared black-and-white film, packed in my Minolta x370s camera. The bright sunshine gave the trees a nice white frosting, but the sunlight also put a big nasty black shadow under the bridge. Almost makes the support for the bridge resemble the “Warped Wall” of those American Ninja Warrior obstacle courses. When I returned last week to the Bridge, it was a very cloudy day. Now that should remove big droopy shadows from under the bridge, for sure. But it would also mean that I would be working with a cloudy day, without bright sunlight. How would such results work with this film? 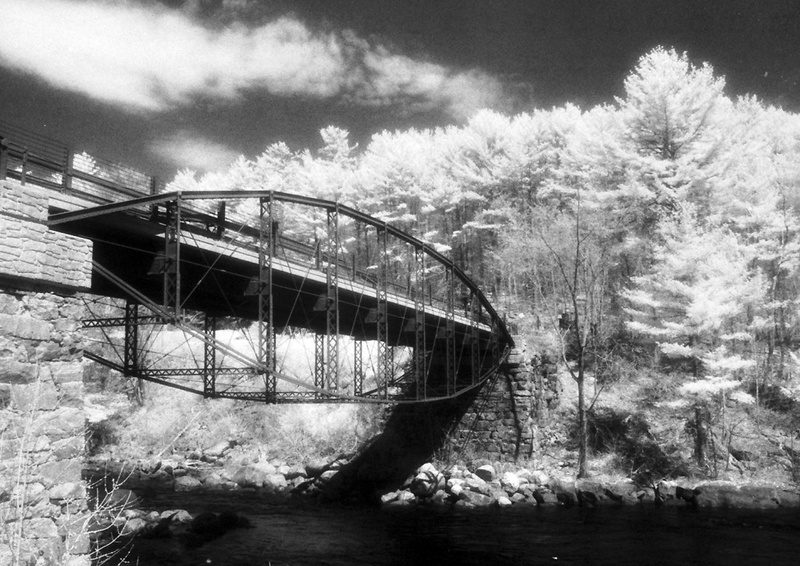 Parabolic Bridge in Infrared. Rolleiflex Automat MX camera, color print infrared film. Photo (c) Chuck Miller, all rights reserved. Ooh that turned out nice. There’s a tremendous amount of foliage along the Sacandaga River, and it really swarmed all over the bridge. And as you can see from the picture, metal and stone are not affected at all by the film’s infrared-color shift, but living items – things with leaves and branches – are definitely feeling the effect. Now what does this tell me? It tells me that if I can shoot bridges and walkways against trees and foliage … those photos will come out as super-dramatic. Okay, let’s try another subject. There’s a barn along Route 9N – it’s covered with creeping ivy and weeds and overgrowth. 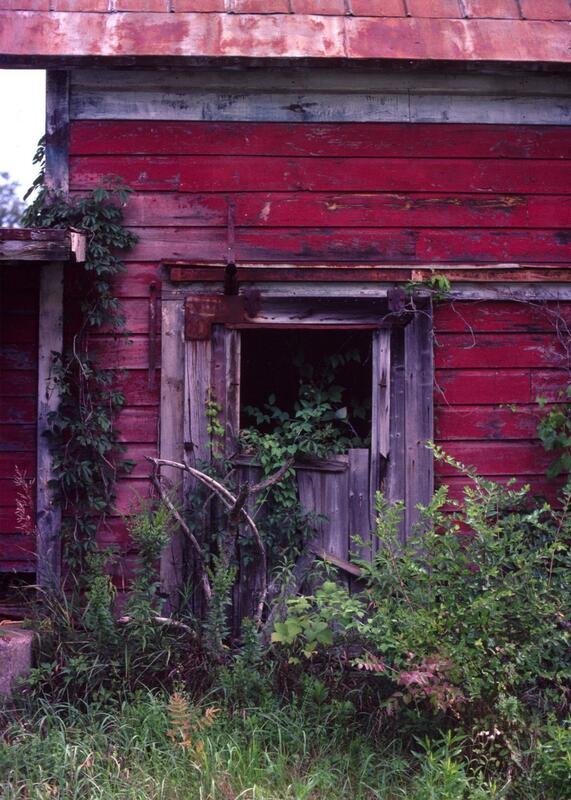 I’ve photographed that barn in the past, in my 2010 Kodachrome picture Barn Versus Weeds. Now I don’t have Kodachrome available to me any more. But I have this infrared film available. All I need to do is walk through as much of the weeds and overgrowth as I possibly can … and hope that nobody spots me and chases me away with their shotgun or their rifle or their Nerf blaster or whatever. And I also have to make sure that I’m not spotted by the property owner. If there IS a property owner. Place looks rather unkempt as it is, what with old vehicles sand overgrowth all over the place. That doesn’t mean there’s NOT an owner. It most likely means there’s an owner who’s not competing for the cover of Better Farms and Gardens magazine. Okay, I’ve got two shots left in the Rollei with the infrared print film. 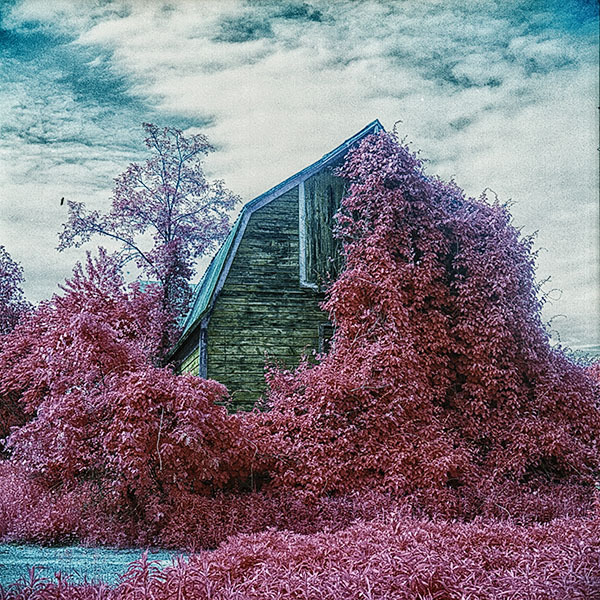 Barns Versus Weeds in infrared. Rolleiflex Automat MX camera, color infrared print film. Photo (c) Chuck Miller, all rights reserved. Another really nice thing about this color infrared print film is that it works well with some of my post-processing PhotoShop and Google Nik software packages. Look at the detail in the barn, in the creeping leaves, in the cloudy sky. And that came out of post-processing. Okay, that roll’s used up. Now I still had an additional roll of Aerochrome infrared slide film – originally I thought my supplies of that compound were all used up, but there’s still some spools to be had if one looks hard enough. And on my way back home, I passed another grave site on Route 9N. But there it was. A tiny marker … with a tiny American flag stuck near it. Oh I can’t resist this. Let’s see what happens with this Aerochrome slide film on a cloudy day. The Grave of Tyler Willcox. Rolleiflex Automat MX camera, Aerochrome infrared slide film. Photo (c) Chuck Miller, all rights reserved. Wow. And you can see, in the film-shift colors, that the green grass and green tree leaves give off different shades of infrared color – seen in this picture as magenta and burnt orange. 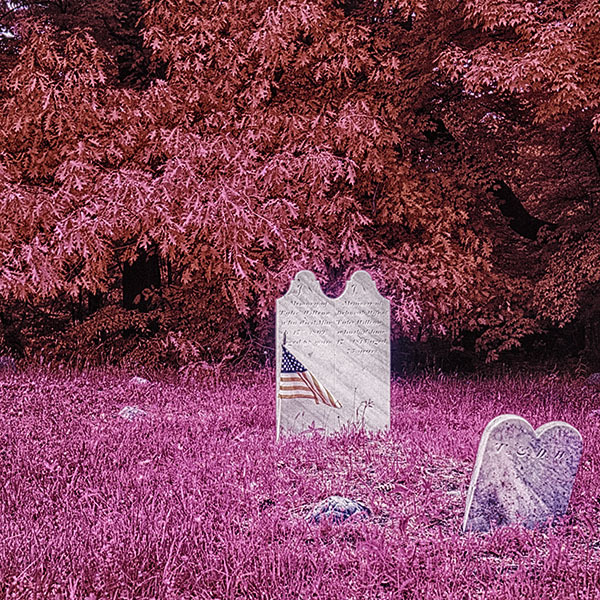 Also … the plastic American flag is unaffected by the color shift, as is the gravestone. Yes, I’m on a kick right now. And I’ll take it right now. I really love the last one. It’s amazing how the colors come out so different. Please enter your email address, and you can follow this blog and receive notifications of new posts by email. A vote for Nelson is a vote for America! Herrschners – how was your customer service to me? St. Paul's Church of Albany blog, "Grain, Oncne Scattered." Alexis Ryder's "Stories I've Never Told…"
Thank you for visiting my blog. You rock.